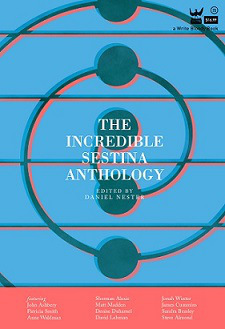 The Incredible Sestina Anthology, recently published by Write Bloody, demonstrates editor Daniel Nester’s penchant for greatest hits. On a Wednesday night at the NYU Bookstore, Daniel Nester is excited, and he bounds to the podium each time another of the poets, recently published in The Incredible Sestina Anthology, finishes their piece. During the reading he sits in the front row in his usual pose, hand on cheek, rapt, along with the rest of the audience. Compiling a varied collection of more than 100 sestinas, the collection is reawakening a genre. Obsessive and enchanting, The Incredible Sestina Anthology is a pleasure to flip through, and an essential to own. For interviews with many of the sestina authors, visit here, for a sestina sampler, see below. You’re crazy if you called this an affair. We slept together, and I made you come. hard truths that fell unbidden from our mouths. Particles of light that formed the stars. You say the Eternal. The eternal is not mine but has a Big Mission. Despite our differences, we manage to create a hoax. Rule one: The mouth rounds open as an O.
Drool, too. Unlike love, drool’s a no-no. Droolers are beat in a big and baby’s dress. can’t answer for by carving a rectangle in the ground. This kind of duplicity is so much more than two. we are poor indeed when only life measures death. The note you dropped became a bird. It sleeps in my chest. Wings abjure in dreaming white. A silence in the canebrake.